I must admit there's only a few perfumes I return to time and time again. I love sweet perfumes, so if you get a headache walking past Lush, this might not be the review for you! Any fans of Angel about? Well say hello to Angels sister, Bonbon. I love sweet perfumes and this one really hits the spot for me. Bonbon offers you caramel, peach and sugar. I also adore the packaging, a gorgeous pink glass bow in a gorgeous pink box, it screams girly which I can totally accept will be far too much for some. Bonbon smells exactly like you'd imagine it too. A total candy dream. Main notes of the perfume are Caramel which really is 80% of the scent, it's the first initial smell you get however it does also contain mandarin, orange, peach, jasmine, orange blossom, gaiac wood, cedar wood, sandalwood and amber. It does have some serious staying power, it seems to go on for hours without fading away so you won't be waving goodbye to your money by applying it every few hours. I will say it is on the much pricer side of life with a 50ml bottle coming in at around £60 it isn't for those looking to save on the pennies. There are definitely other perfumes on the market that will give you that sweet kick without the huge price tag. 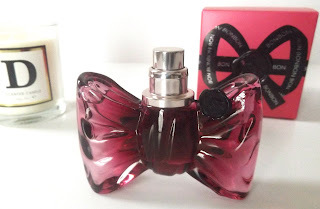 Over all I love Bonbon, it's not my every day perfume but this is a repurchase! It's one to consider if your feeling a bit flush and fancy a treat! Have you tried Bonbon before? The bottle is so pretty! I'll have to give it a go, none of my perfumes seem to have any staying power.